8 x 10 cropped gelatin silver print, made from an 8 x 10 glass plate negative taken by James Burton on October 4, 1901. Printed by Rosenfeld and Sons with a matte finish, date unknown. 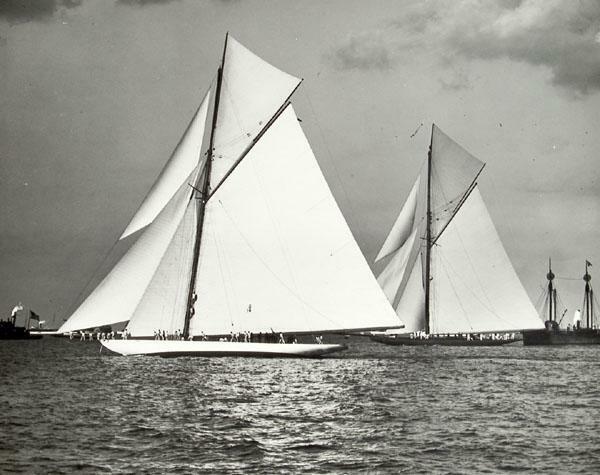 Port beam view of the sloops COLUMBIA (G/14) and SHAMROCK II at the finish of the final race of the 190 America's Cup. Several spectator vessels seen in background include steam yachts, three sidewheel steamers, a lighter, and several tugs. Crew members seen climbing out on bowsprit as COLUMBIA crosses the finish. Handwritten on back: "1901 Close finish Columbia + Shamrock".